Edinburgh – Tattoo – history – videos, photos, words. Images and history of Dumbarton Rock and Castle. 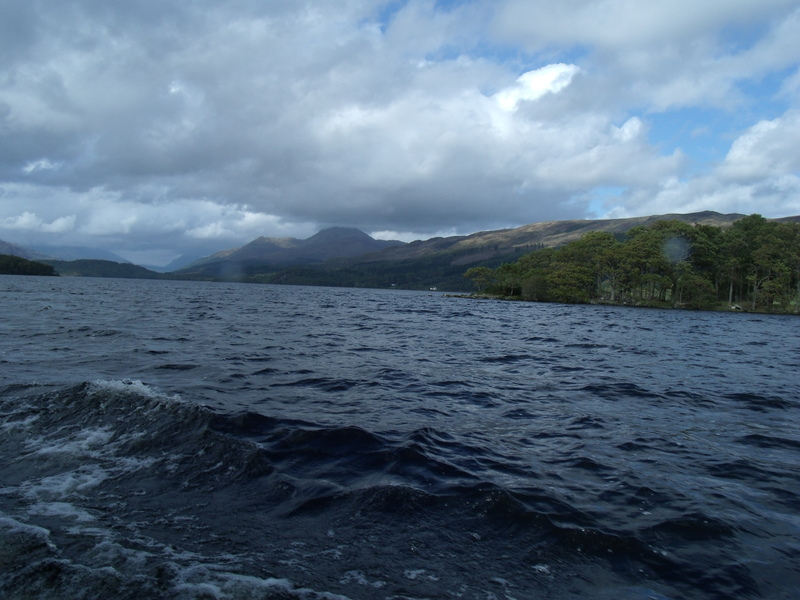 Loch Lomond – Summer Spectacular: a visual feast – images, videos, words. Joyful Journey: Part 15 – Scotland’s Sea Kingdom: The Isle of Lunga, Treshnish Islands. Antonine Wall Photo and historical information on Roman Antonine Wall. Roman Britain History and images of Roman Britain. 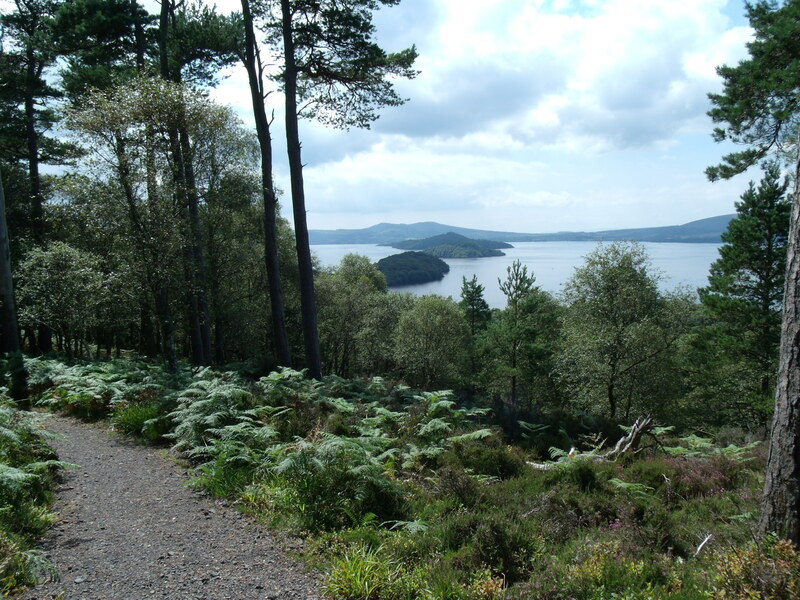 ‘The divine, the illegal, the insane and the eccentric have all found havens in these islands.’ Fiona Price, Loch Lomond & The Trossachs National Park Authority. Communications Unit. FraochEilean, Heather Island. 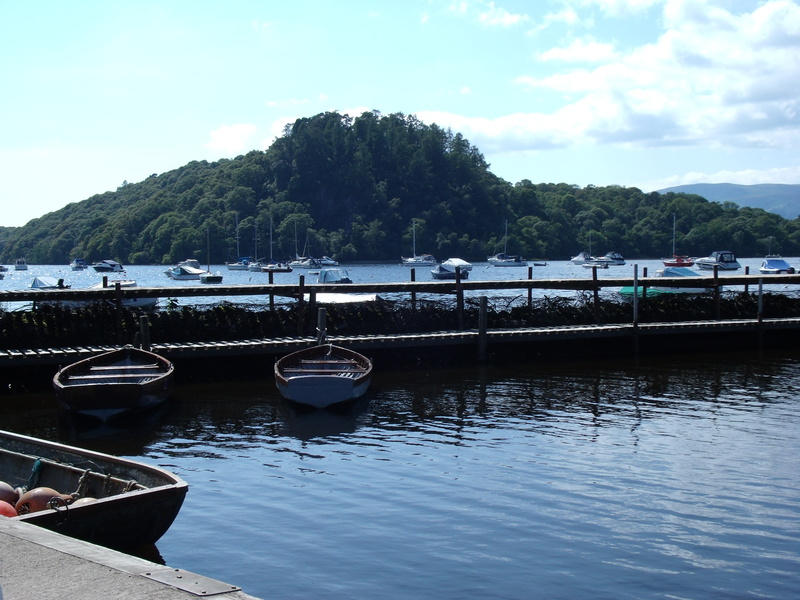 This picturesque island is shown on a 1792 map as ‘Luss Prison’. 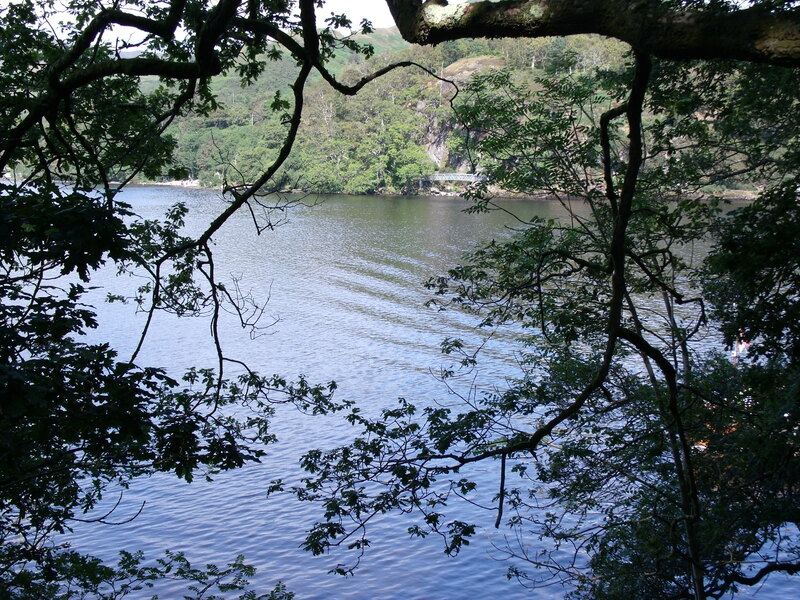 As near as it is to Luss, it would be a convenient place to isolate offenders. Reportedly, nagging wives were also banished here. At only 150 metres long and 12 metres high, there couldn’t have been many wrongdoers. Inchconnachan, Colquhoun’s Island, faces Inchtavannach across The Narrows. There are several stories and some strange facts associated with it. That there are still wallabys living happily on the island after being introduced there in the past, at a date unknown to the author, has been proved to be correct. 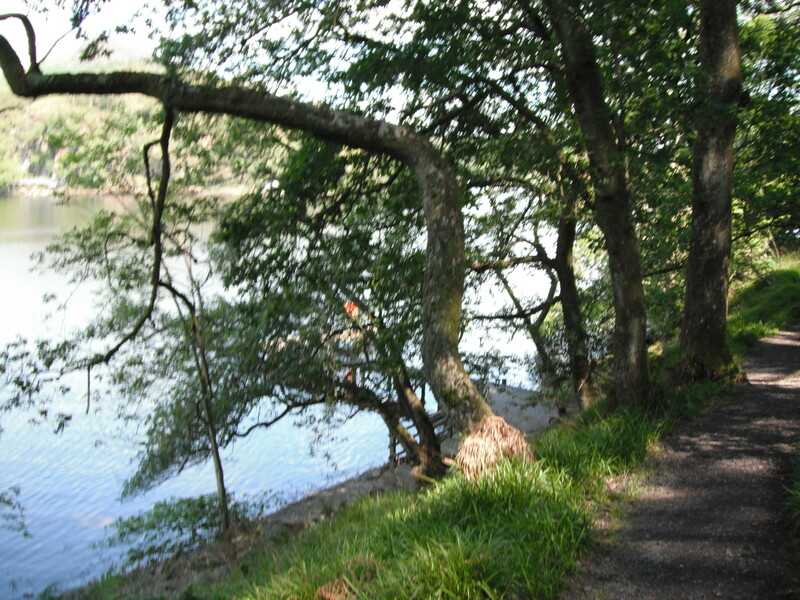 Unlike Inchtavannach, just a narrow strait away, Inchconnachan is not reknowned for church bells and saintly behaviour. Other than the wallabys, the main claim to fame comes from the 1930s, once very secret, presence and operation of illegal stills that supplied whisky to the Vale of Leven and Glasgow. Another story tells of one, Admiral Sullivan, a retired tea merchant, who, in the 1920s, built an Indian style bungalow on Inchconnachan. It is still used by the present owners. He also brought electricity to the island. How he did this is unknown to the writer at this time. When his business collapsed, the Admiral took himself off to live out his days in a dungeon on Eilean a Bho, Island Of The Cow, at the north end of the loch. 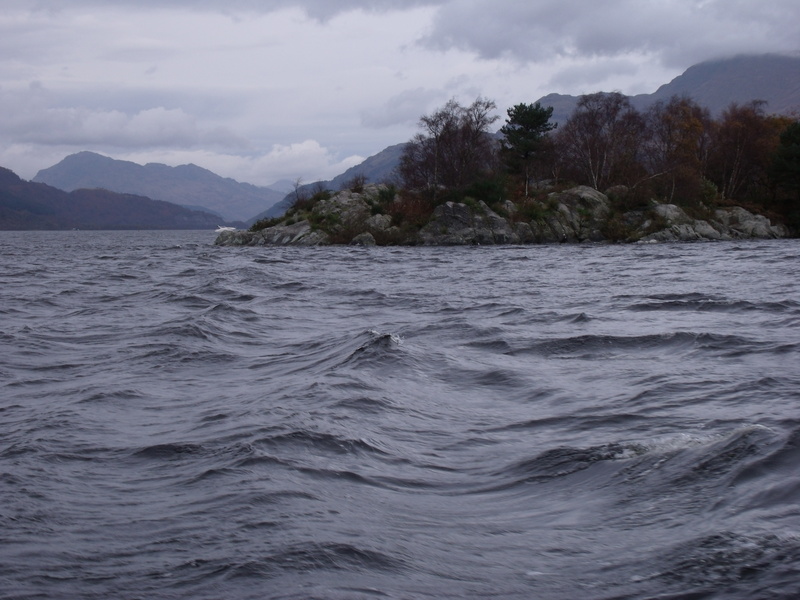 This island is more commonly known as ‘Island I Vow’, a corruption of the original Gaelic name. In the Gaelic alphabet, there is no ‘v’. The vee sound is written bh. The ‘a’ would be sounded ee or short i. It is natural to assume,then, that, ‘Eilean a Bho’, ‘Island Of The Cow’, would become ‘Island I Vow’. The name probably had something to do with the resident McFarlane clan members penchant for night raids of neighbouring cattle. 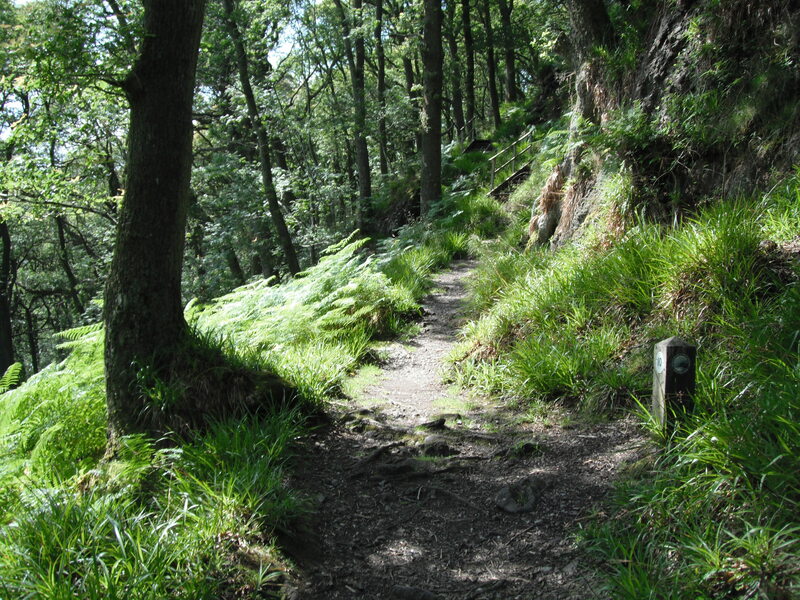 The moon was known in that area as ‘McFarlane’s lantern’. 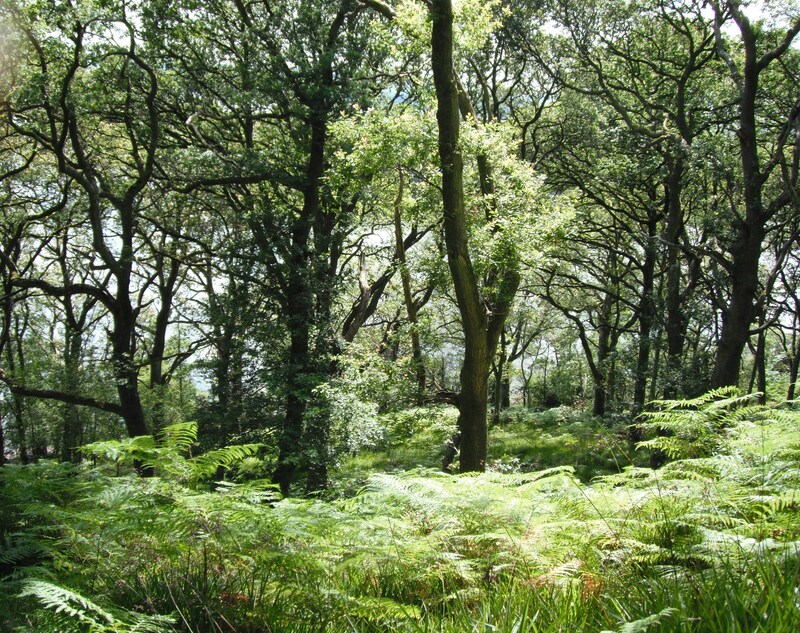 Note: The title of this portion of my blog is ‘Islands And Their Stories‘. Said stories do not purport to be scholarly, historical accounts. There are other tales and opinions about the origin of the name, ‘Island I Vow’. Readers are encouraged to consult more academic texts if they wish to engage in debate about which version is correct. 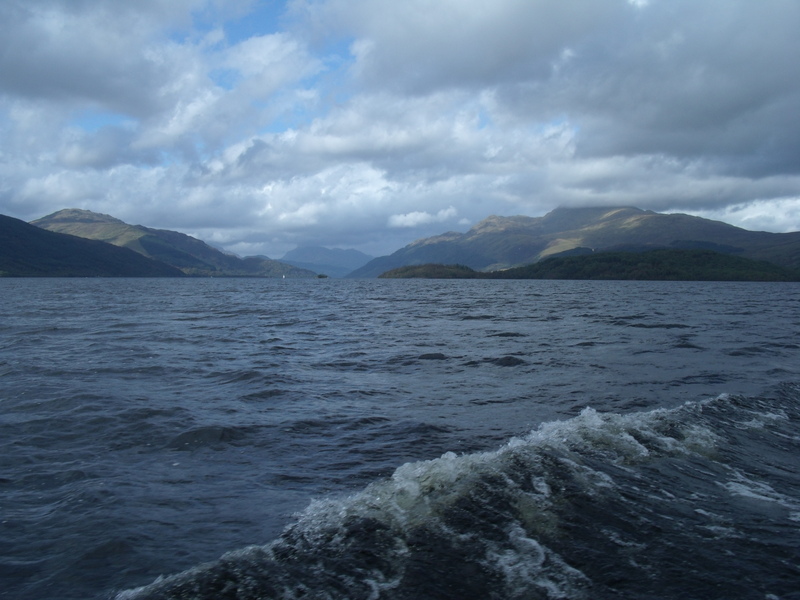 Living close to Loch Lomond, as I do, I chose to relate the local lore. 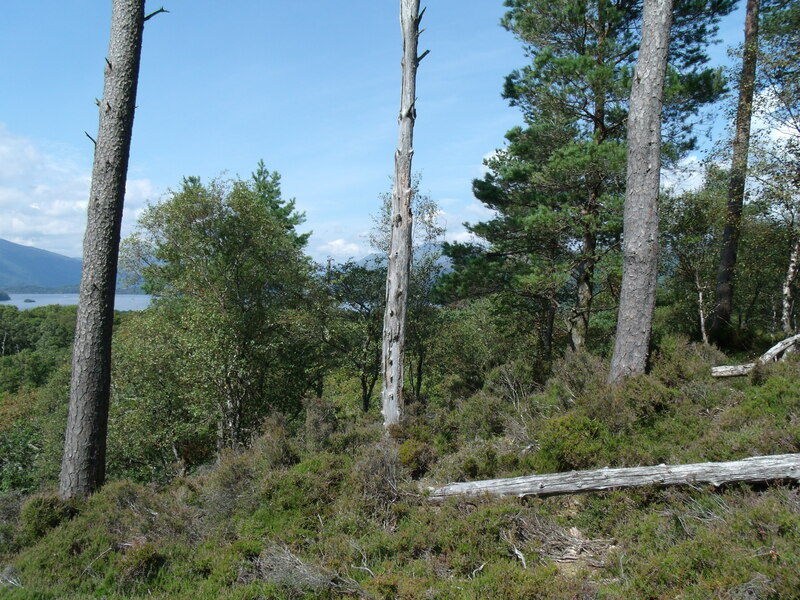 In the video following, as we sail along the west side of Inchconnachan, Admiral Sullivan’s bungalow can be clearly seen in a clearing near the shore. The present residents have a boat moored close by. 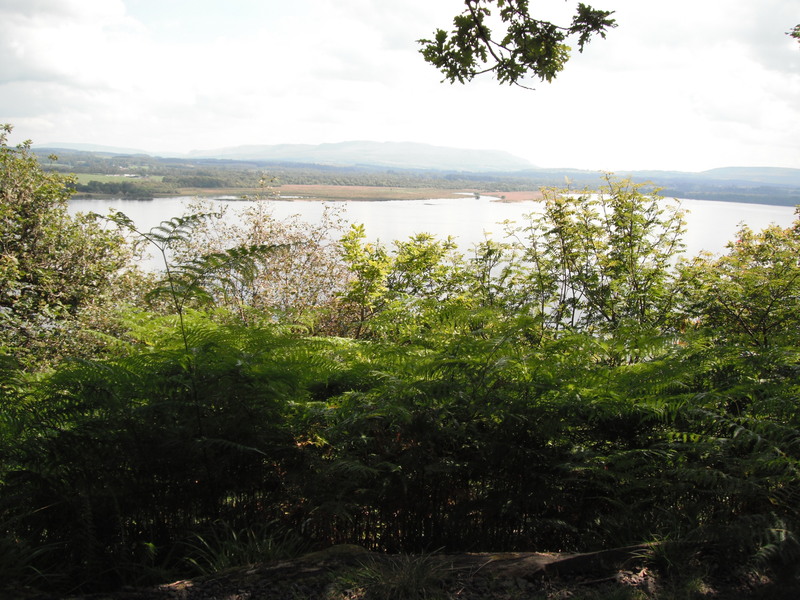 Bucinch, Island of Goats, (right) is unspoiled and covered in impenetrable trees and undergrowth. Taking the name into consideration, there must have been goats farmed or kept there at one time. I have, so far, been unable to find any record of this. In fact, unlike most of the other islands, Bucinch seems devoid of known history. Fishermen once had a small, stone shelter there, the foundations of which remain. A plaque recording the death of a young man is fixed to a rock but no information about him is available. Nearby, another memorial to four Clyde shipyard workers who drowned is the only clue that this small island was once a place of pleasant pastime. 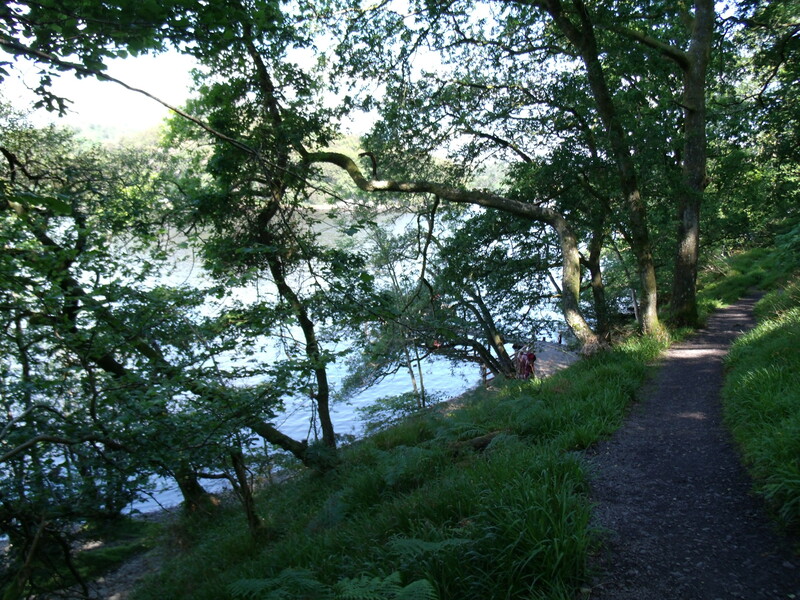 Inchcruin, Round island (left) is mostly wooded and has two sandy bays at the south east end. Unlike Bucinch, quite a lot is known about it. Farmed until the mid 19th century, it has seen some colourful characters. One of the island’s owners kept an ex-US army truck which he used to get about, roads or no. Round island may not be the correct translation from Gaelic. According to a 19th century gazateer, in the 18th century, Inchcruin was used for ‘the confinement of insane people’, and may have got its name from a corruption of the Gaelic phrase ‘chan’eil e cruinn’ meaning ‘he is insane’. September and October brought heavy rain almost every day. Towards the end of September, then again at the end of October, the downpours held off for a day. 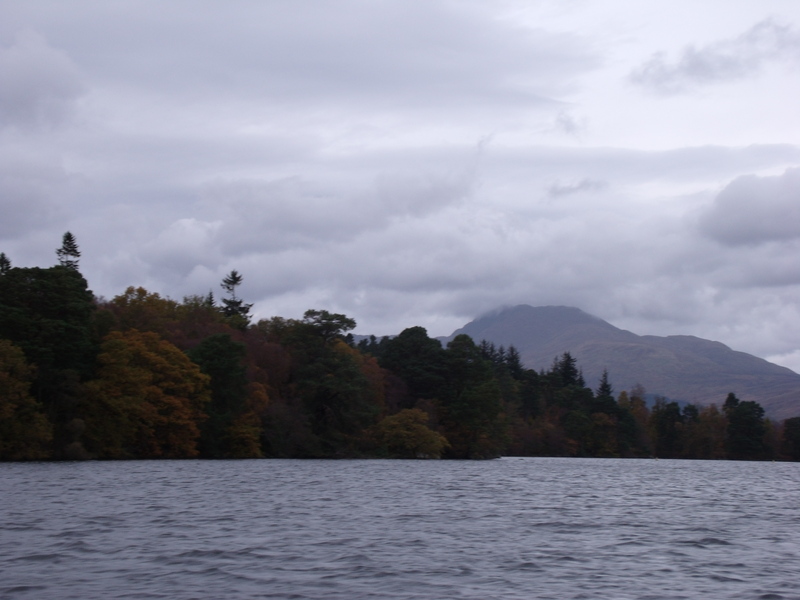 This allowed me to take a couple of trips on the Lomond Warrior which I boarded at Luss. Blustery winds and cloudy skies made for very different images than those captured earlier in the year. While the jewel-like shades of summer are more to most people’s taste, the loch has many moods and no two days have colours exactly alike. 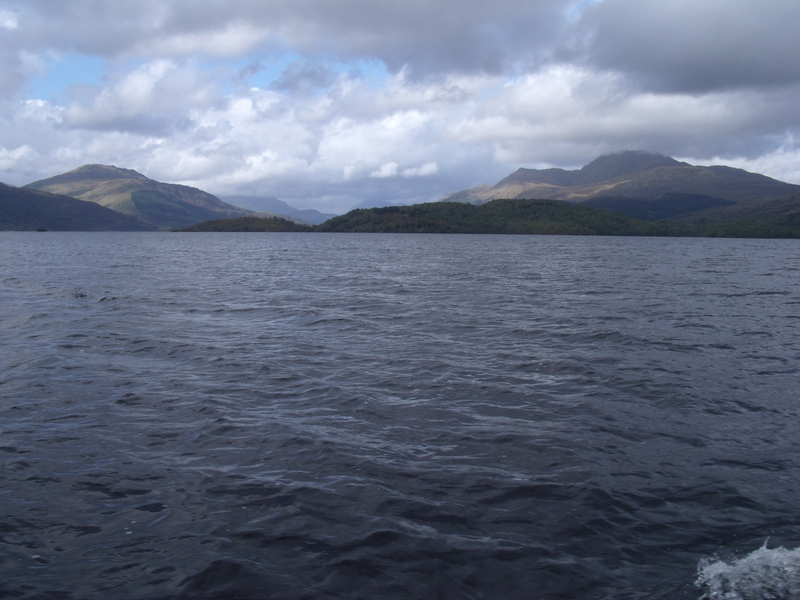 There are about sixty islands in Loch Lomond but not all are always visible. Water levels dictate how many are exposed at any given time. Those that are constantly with us all have stories – varied and fascinating. In this section, I’ll post photos or videos of a few that I’ve encountered on my travels and am able to identify. I haven’t yet found a proper map naming them all, but my quest is to identify and record an image of all those that have a story. It was a blustery day, but the rapidly gathering clouds hung on to the rain until the end of the trip. The next video was taken as we sailed through The Narrows, as is called the strip of water between Inchtavannach and Inchconnachan. I was facing the latter as we progressed. 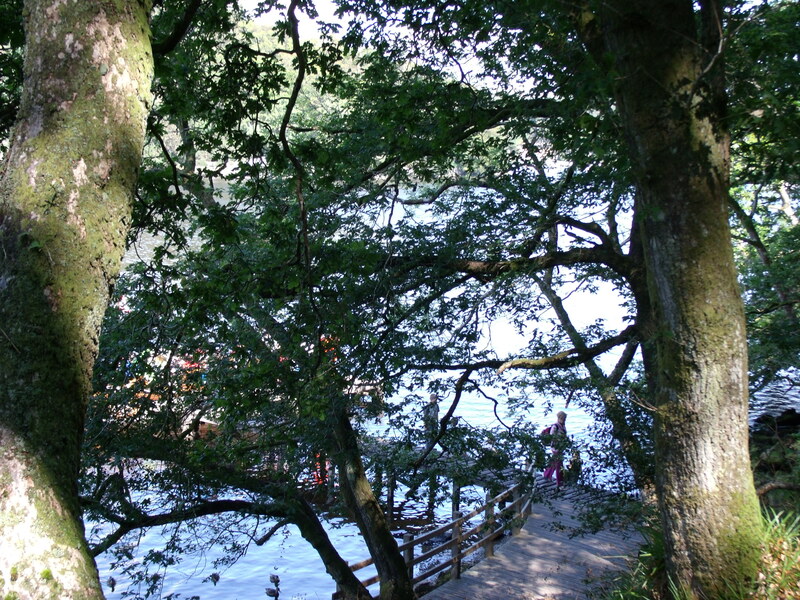 The narrow strait between these two islands is reputed to be the most beautiful part of Loch Lomond. Someone long ago wrote. ‘Whosoever does not know this beautiful strip of water has entirely lived in vain.’ Strangely, although this water is not more than 2.5 fathoms deep, it never freezes, even when much deeper areas do. When, in deeper parts, the ice has been thick enough to drive horses and and sleds about safely, this stretch has remained totally unfrozen. This was so even during the great freeze of 1740. Not only is the water shallow, it has no discernible current. Inchconnachan, Colquhoun’s Island, shown in the video, has many interesting stories, the most famous not a story, it seems, but an actual reality. Someone, I don’t know who, released some wallabys onto the island in times past. Again, I am not aware of the date. Some of the wallaby ancestors still frequent the island and, while many thought this just a legend rather like the Big Foot sightings, a tourist really did get a photograph of one with her son in the foreground. Inchtavannach, Island of Monks, not seen in the video, but opposite Inchconnachan across The Narrows, was home, in the 6th century, to St Kessogg . He built a monastery and the ringing of the bell could be heard for miles around. 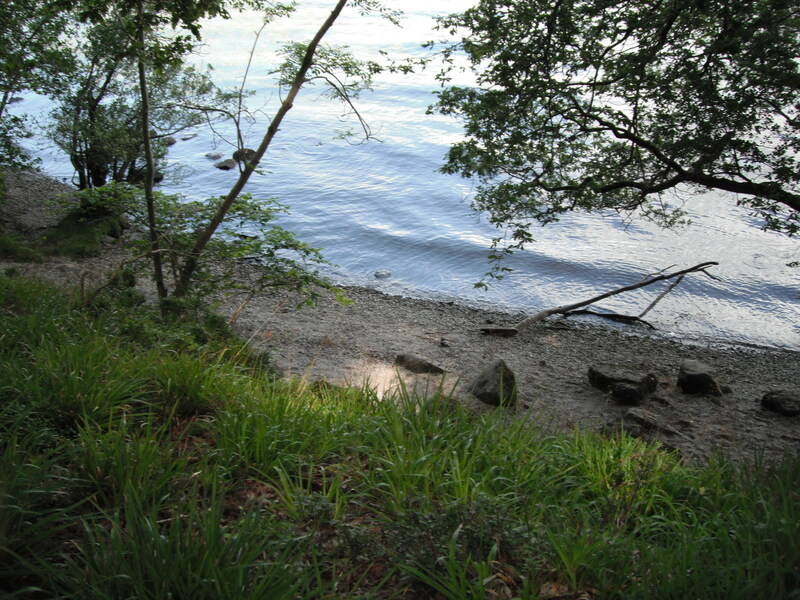 His stay was brief, a decade or so, cut short when he was murdered at Bandry Bay, near Luss. Inchlonaig, meaning Island Of Yew Trees, is named for the trees found there. 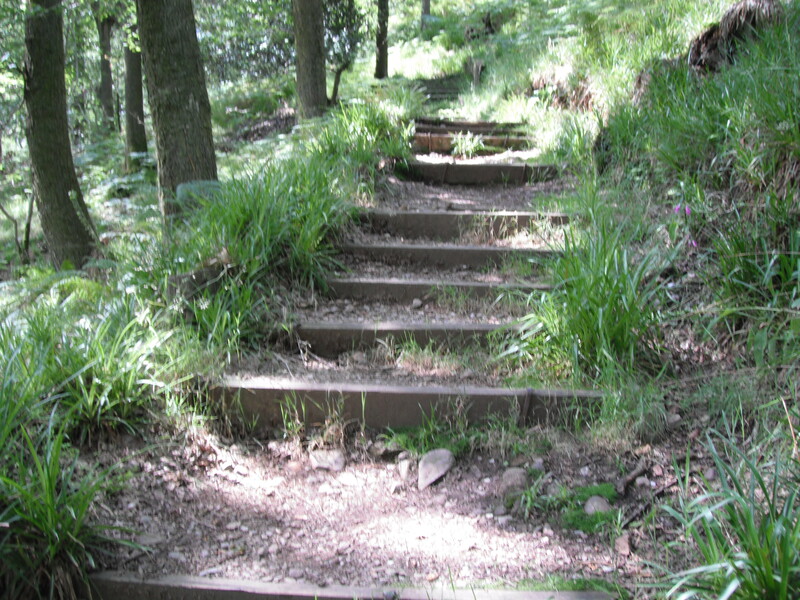 It is believed that these were re-planted by King Robert The Bruce who used the yews for the bows of his archers. The Colquhouns owned and resided on the island where they farmed deer. In 1873, two Colquhoun family members, both gamekeepers were drowned while returning from a deer hunt. 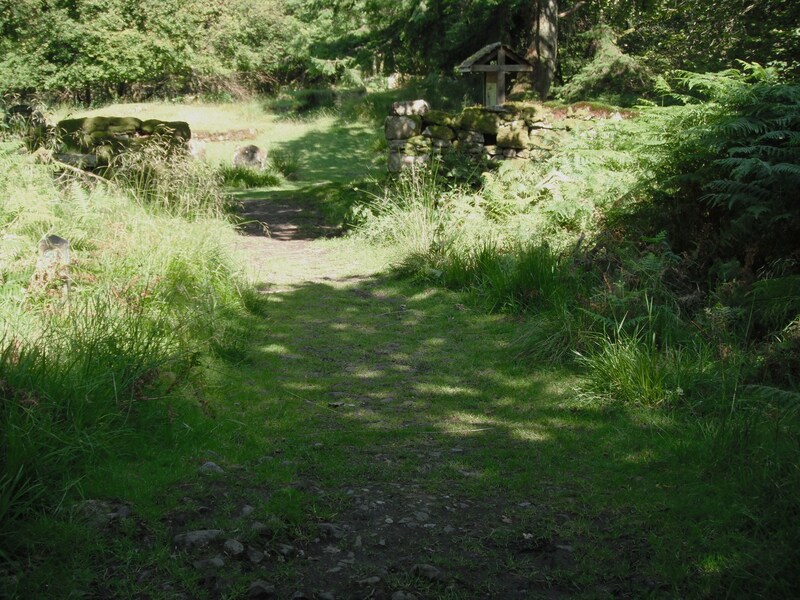 A ruined cottage and lime kilns, as well as Mesolithic remains, are to be found on Inchlonaig. Ellanderroch, the tiny island to the left of mile long Inchfad, is the Island of Oak, with some surprisingly large oaks growing there. Good fishing attracts many fishermen who use Ellanderroch for shelter in bad weather. For reasons unkown to the writer, a hollow oak was, at some time in the past, filled with concrete. A lightening strike burnt away the wood, leaving a pillar of concrete as a lasting memorial to someone’s foolishness. Inchfad, The Long Island, is a mile long and only 70ft. at its highest point. A short canal near the north eastern tip was once used by distillery workers. While this area abounded in illegal stills, the one on Inchfad was lawful. Today, the canal is used by the island’s owners as a harbour. 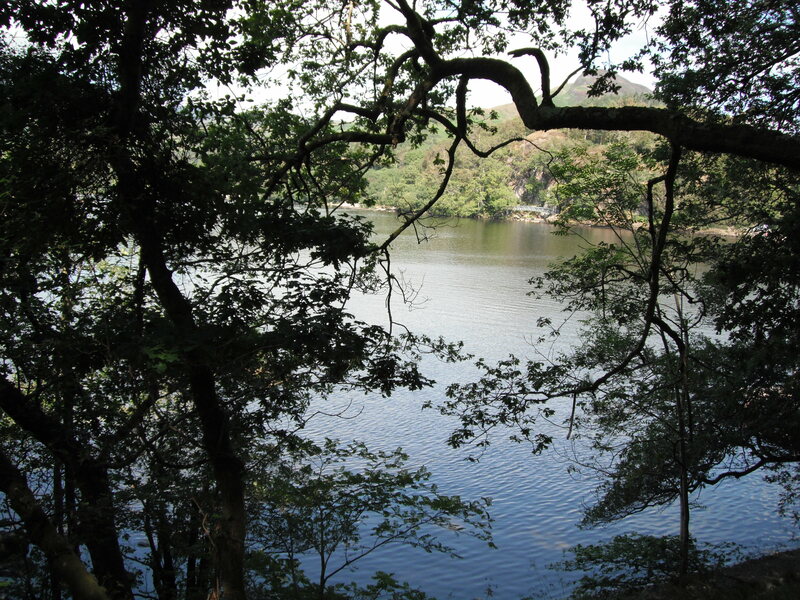 It was late July when I visited Inchcailleach, the old name for this island, now known as Inchcailloch. The name is Gaelic for ‘Island Of The Old Woman’. 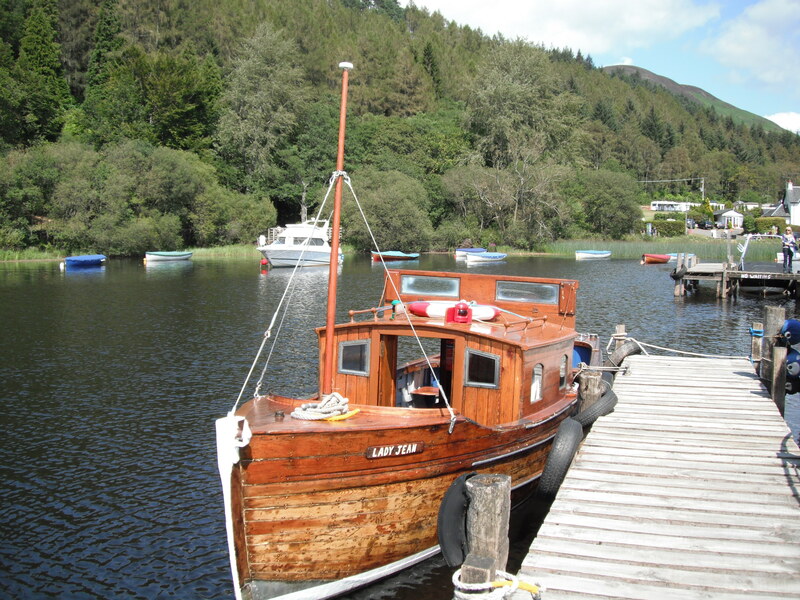 I sailed from Balmaha on the Lady Jean, one of many small boats owned and operated by the MacFarlane’s boatyard. First, a couple of videos of my trip in the Lady Jean, a charming little wooden boat, one of several, that sails from MacFarlane’s boatyard. Immediately on landing, I felt the uncanny feeling of total peace that pervades this little paradise. I divided my exploration into two consecutive afternoons. The first day, contenting myself with visiting the old churchyard. On the second, I climbed the island’s highest point, getting a photographic record along the way as I walked in the steps of the old woman. The following information I got from the internet. The old woman in question was St. Kentigema (mother of St Filan) who, in 717A.D., came from Ireland with her brother and son, settled on the island and made a big enough impression on the populace of the mainland to have, in the 12th century, a church built in her memory. To this house of worship, for the next 500 years, the local mainlanders came each Sunday, rowing back and forth. 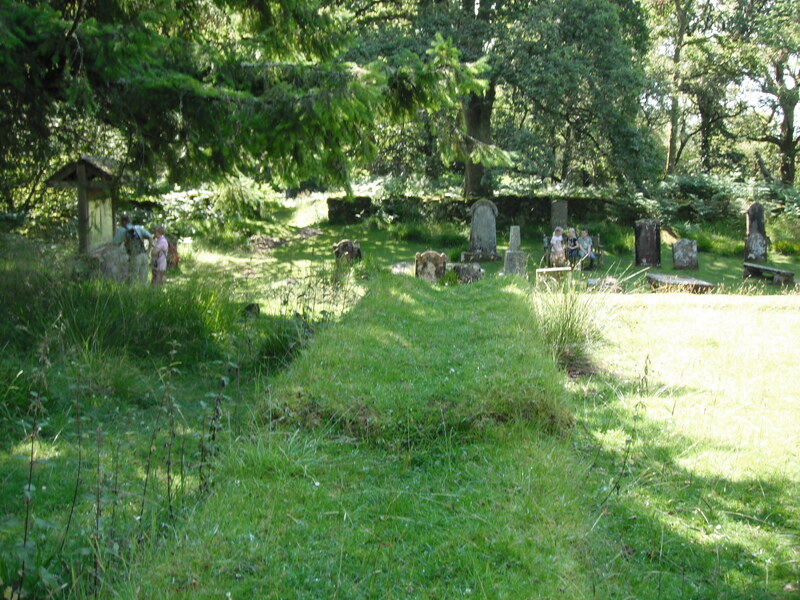 Here, the community graveyard was also situated. 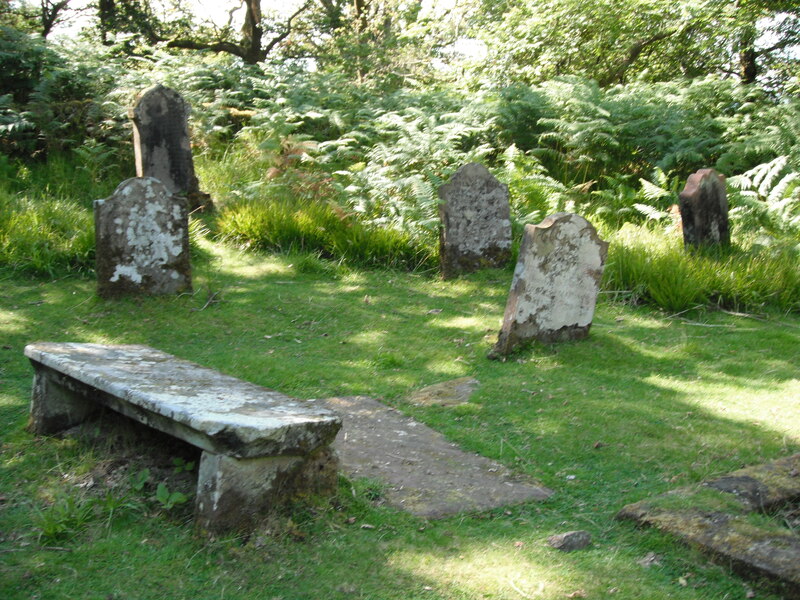 The foundations of the church are still intact as are many of the more recent grave stones. Most of the ancient ones are long covered and overgrown with grass, but two old, if not ancient ones, remain above ground. The names most common in the graveyard are MacFarlane and MacGregor. 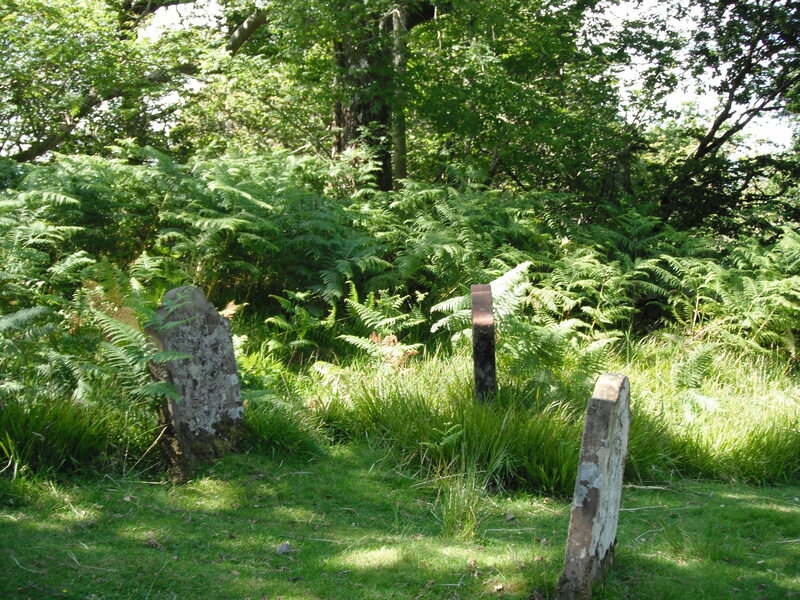 The two oldest stones still reportedly visible and identifiable are Gregor MacGregor 1623 and Duncan MacFarlane 1783. However, I was unable to locate them, in part, because I did not have my reading glasses with me. 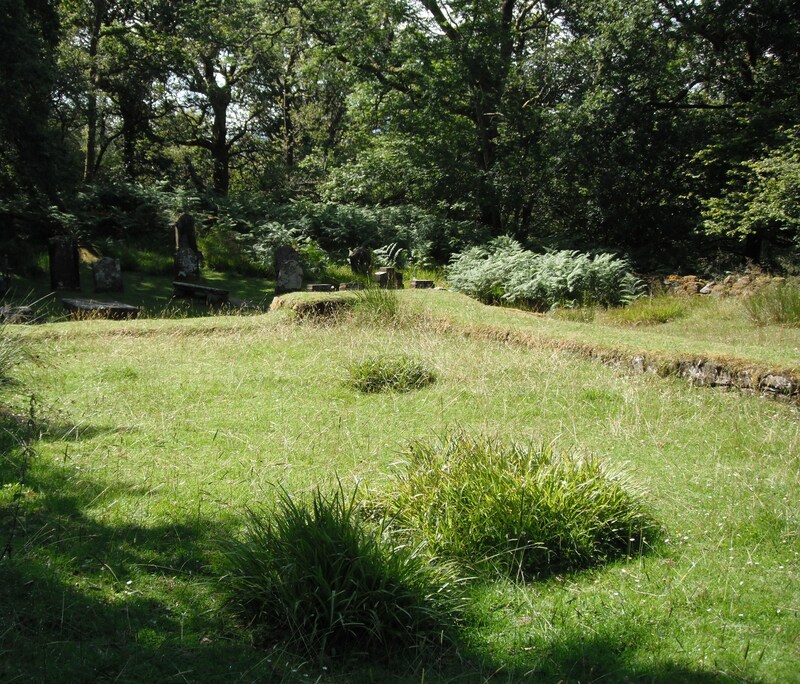 Gregor MacGregor was clan chief and an uncle of Rob Roy MacGregor, who, some claim, is also buried here. Conflicting claims have him buried at his home town near Stirling. In a corner of the churchyard is a covered storage area that houses remains of the original 12th century church building. Below is a photograph of a few of these amazing relics. In Scotland’s wet, inclement climate, it’s miraculous that they have survived in such perfect condition. 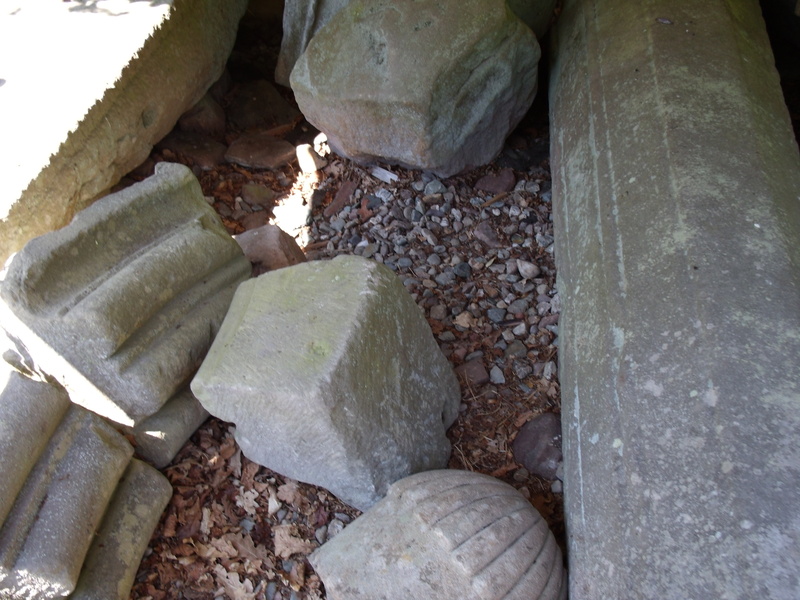 The stones that were used to build the church proper would have been recycled when the farmhouse and other structures were erected shortly after the house of worship fell into disuse in the 17th century. 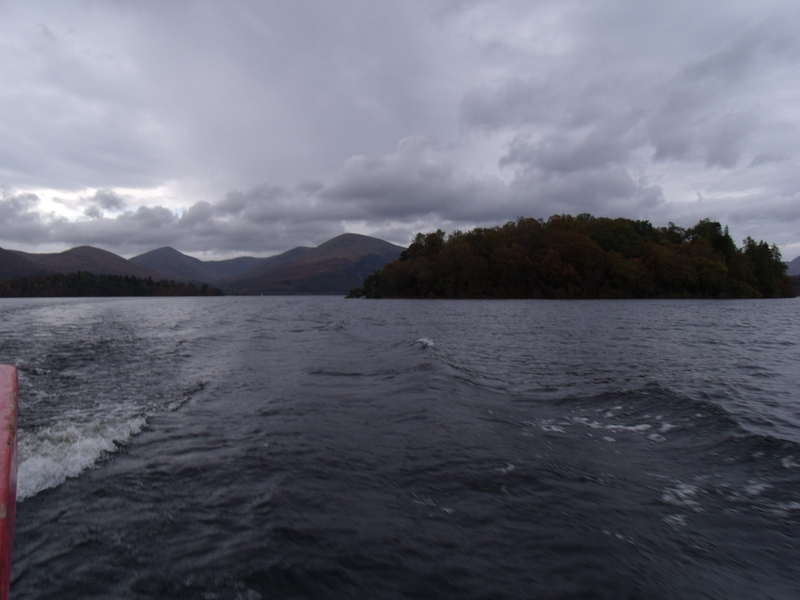 Below are a few photos I took on the return journey down to the Jetty where I boarded the ‘Margaret’, sister to the ‘Lady Jean’ for the return trip to Balmaha. 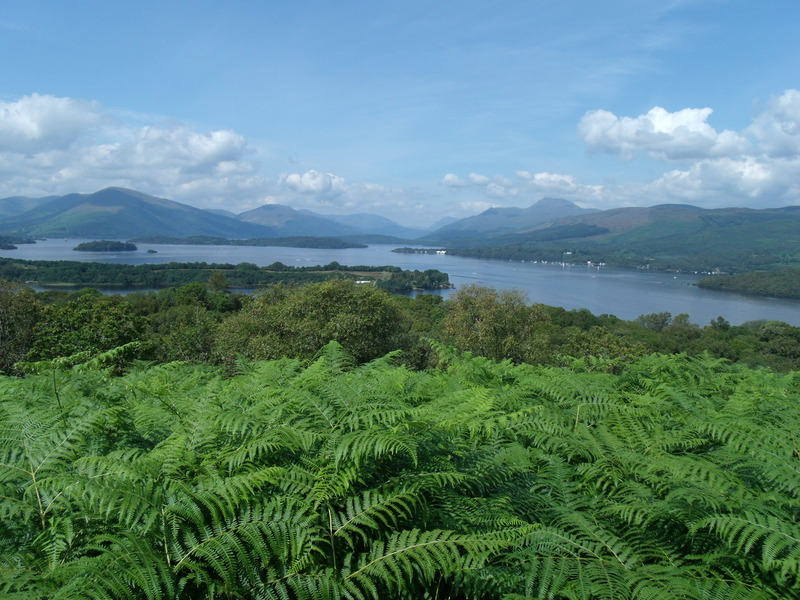 For information about Loch Lomond And The Trossachs National Park, click on link below. 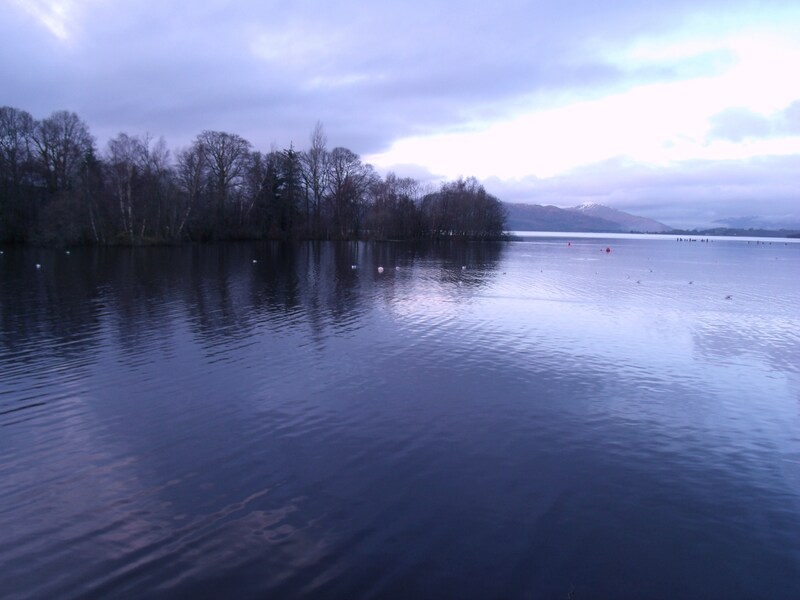 The first photos and videos I posted in ‘Loch Lomond, Limericks And Life’ were taken in November and December of last year. This posting sees the start of another winter; a very different winter. While last year was arctic cold for months with much snow in early November, it is now late December and we have just had our first snowfall. High winds and torrential rain have been the extremes since September. The wetlands video that follows is evidence of just how wet it has been. Back in the Spring, I walked on the ground that is now covered in water.